Портал "Культура" • А. Пузиков: Физика Беспредельности. 3-я редакция. The purpose of this research is to construct a theoretical model of the structure of the physical world based on the fundamental postulate - Being is a sequence of states of Limitlessness. One of the main conclusions of the research is that any objective existence in conditions of Limitlessness is possible only in its closed and limited relativity, defined as localization. Any localization in Limitlessness can be measured only by itself, which implies the mandatory restriction of localization by a positive number of its elementary reflections in itself. This research allows us to draw a completely accurate conclusion about the limiting number of our Universe, as localization in the Limitlessness. The theoretical model allows explaining the origin and evolution of the Universe, the essence of the basic physical laws. Not contradicting already available scientific data, this model allows calculating the exact sizes and characteristics of the Universe and its elementary identical state - the neutron, explains the appearance of four-dimensional space-time and right-sided twisting of electromagnetic forces. It establishes a general principle of electrical and gravitational interaction and the exact relationship of the gravitational constant and the Planck constant and allows us to calculate the speed of the Earth's motion relative to the Universe. The coincidence of theoretically calculated values with known experimental data confirms the correctness of this model. The theoretical model analyzed in this research is only partially disclosed. Further possibilities for the disclosure and analysis of this model are enormous and require a mass participation, both theoretical physicists and experimenters. © Any reprint or duplication only with the consent of the author. It is permitted to make copies for personal use. The purpose of this research is to construct a theoretical model of the structure of the physical world based on the fundamental postulate – Being is a sequence of states of Limitlessness. Limitlessness in its all-encompassing essence cannot be defined within the framework of formal logic, since any definition automatically imposes a restriction on the object being determined. Therefore, in giving the definition of Limitlessness, we recognize that we do not define Limitlessness as such, but the primary substance in which the evolution of our being takes place, which is the consequence of the primary restriction expressed in that it exists. The Limitlessness is that which has no limitations. Let us prove three basic theorems of Limitlessness. Limitlessness, or what has no limitations, is all-encompassing. Let's assume that there is something that is not covered by Limitlessness. In this case, Limitlessness is a limit, expressed in the fact that Limitlessness does not cover this something. This contradicts the definition of Limitlessness. Consequently, the theorem can be considered proved. Any part of Limitlessness is identical with the whole of Limitlessness. If in any part of Limitlessness there are some limitations, it follows that Limitlessness itself is limited by these limitations in this part of itself, which contradicts the definition of Limitlessness. Therefore, parts of Limitlessness cannot have limitations, and thus is completely identical to all Limitlessness in accordance with the definition. The theorem can be considered proved. The Limitlessness is symmetrical with respect to any of its parts. If the Limitlessness is not symmetrical with respect to one of its parts, it will mean that Limitlessness is divided into two parts that are not identical to each other, which contradicts theorem (t2). The theorem can be considered proved. It follows from Theorem (t2) and Theorem (t3) that any part of Limitlessness is symmetric with respect to any other part of it. In accordance with the theorem (t1), any being is a part of Limitlessness. But the existence of any form in space and time, as well as of space and time itself, is inextricably linked with a certain defining and limiting condition. On the other hand, in accordance with the same Theorem (t1), this defining and limiting condition must also be part of Limitlessness. It turns out that Limitlessness at the same time has no limitations, and contains all possible limitations. Moreover, each of these limitations is part of Limitlessness and must be unlimited in its essence! Nevertheless, this paradox only seems. Proving the basic theorems of Limitlessness, we did this with respect to Limitlessness itself, or, turning to the language of modern physics - in the reference system connected with Limitlessness. Accordingly, in this reference system, any form, possible to exist or existing, a form containing a certain partial restriction, has no limitations. Restrictions exist exclusively in the reference system associated with each of the existing forms..
Any being already by the very fact of its objective existence imposes on itself certain self-restrictions in its internal relativity. We call this the state of Limitlessness or the self-limiting reflection of Limitlessness into itself. The state of Limitlessness is the reflection of Limitlessness into itself in conditions of relative internal self-limitation. Internal relative self-limitation is a localizing phenomenon, defines a local form with relative relationships of its parts, within the framework of this limitation. - Being is a sequence of states of Limitlessness. Since all our being is a certain successive process of changing states, Limitlessness in accordance with Theorem (t1) must include such sequential processes, and by Theorem (t2), being a part of Limitlessness, they must not have limitations. Thus, stating the existence in the Limitlessness of the system of reference in which an unlimited change of the Limitlessness states takes place, we need to conclude that the probability of random fluctuation, as a local allocation of something in Limitlessness, equal to one. On the other hand, this phenomenon of random fluctuation itself is such a relative system of reference in which from the moment of this random fluctuation, an unlimited process of state change is triggered. To this, we should add that Limitlessness by definition must include into itself all possible random fluctuations. However, considering all possible random fluctuations, we proceed from the possibility of comparing them with each other, and this is an erroneous proposition, since in Limitlessness there are no measures for measurements and comparisons, since any measure is a restriction. Thus, we must regard random fluctuations as a phenomenon in itself, which has nothing to compare with, except for Limitlessness and itself. Limitlessness is the only possible measure for measuring yourself in local self-limitation. All hypothetical random fluctuations in Limitlessness are indistinguishable from each other and represent one single phenomenon. This phenomenon consists in the fact that by the fact of random fluctuation Limitlessness is divided into two parts: this fluctuation, as an objective phenomenon A, and everything else that is not this random fluctuation A (not A), Fig. 1. a). We call this phenomenon localization. Localization is a relatively-limited reflection of Limitlessness into itself. We emphasize that localization is a limited reflection of Limitlessness in the reference system associated with the manifested part. In other words, for the manifested part of the localization, whole Limitlessness reduced to complex sizes of localization, consisting of the manifested part and complement. This limiting condition for the separation into two identical parts should be reflected in all parts of the localization. The primary relative division of Limitlessness into two identical parts is the fundamental basis and cause of all subsequent divisions and relative limitations of objective existence in localization. From the conclusion (c3) in the previous chapter it follows, that localization should be reflected in two ways separately, both in the manifested part and in the unmanifested. The measurement is a way of reflecting the localization into itself. Two different ways of reflecting localization in its manifested part are two independent dimensions. Thus, the manifested part of the localization is two-dimensional. The manifested part of the localization is two-dimensional. By the law of identity, the additional part of the localization is similarly two-dimensional. We have considered the phenomenon of random fluctuations, in a reference system associated with a given fluctuation. Since this phenomenon manifested itself in Limitlessness as a phenomenon of complex localization consisting of two identical and opposite parts, this complex localization itself is a reference system. In this new reference system, the entire complex primary localization is the manifested part. Accordingly, there is an addition to it, consisting on the principle of identity from two local reflections of Limitlessness, Fig. 2. A + A=A(1), where A(1) – realized part of the localization of the next first order. A(1) + A(1) = A(2) , where A(2) – realized part of the localization of the second order. Thus, random fluctuation generates an infinite sequence of localizations. Since localization is part of Limitlessness, it is identical to it in all its properties within its self-relative limitation. From the identity of localization reflections in its manifested part, it follows that none of these reflections should have a marked advantage over others. This condition is satisfied only in a closed symmetric structure, in which there is no origin and center. Adding to this the condition of two-dimensionality of the manifested part, we get that the manifested part of the localization is a closed non-Euclidean two-dimensional structure. It is impossible to depict this structure on the Euclidean plane of the figure, but in a certain conventionality, it is possible to depict every dimension of this structure in the form of a closed circle from a certain set of localization reflections into itself, Fig. 3. By the principle of symmetry (Theorem (t3)), the number of reflections of localization into itself in each dimension is the same and is an integer derived from the primary division into two parts. The main number of localization is a positive number n equal to the number of identical reflections of the localization into itself, which fit in a closed cycle for each of the measurements. An elementary state of localization is one of n completely identical reflections of localization in itself along any dimension. Thus, all the processes in the localization are measured exclusively by the relationship with the main limiting number and the localization itself, as a unit. Such localization is our Universe, with all its physical laws, which we will prove later by concrete calculations. Moreover, we clearly define the limiting number of our Universe and show that this number is the basis of all the physical qualities and properties of our physical world. It follows from Theorem (t2) that with respect to any of the elementary states of one dimension, all elementary states of another dimension must be reflected. Thus, the total number of elementary states in each of the two parts of the localization should be equal to n2. We draw attention to the fact that the fact of appearance random fluctuation in Limitlessness determines this fluctuation as the basic reference system. Let's call it a global reference system. A global reference system for localization is a reference system associated with random fluctuation, which is the cause of this reference system occurrence. Relative to this global reference system there is an allocation (random selection) of one of the external dimensions of the two-dimensional structure as areas of mutual reflection or symmetry between the manifest and external, additional, parts of localization. Thus, the global reference system is linked to the particular position on this, allocated, dimension. Second, additional dimension of the external two-dimensional structure does not have an dedicated linking to the basic reference system, Fig. 4. Thus, unlike the usual representation of two dimensions in the form of mutually perpendicular vectors originating from a single point, we also have two mutually perpendicular measurements, but one radial ru having a starting point, and the second angular rd, or a measurement in a closed cycle, which does not have a starting point. These differences between the measurements of the manifested part of the localization are identically reflected in the outer part, and it is similarly formed by radial measurement and angular. A radial measurement is a measurement having a fixed position in the global reference system. An angular measurement is a measurement that does not have a fixed position in the global reference system. Thus, the usual view in modern physics on the dimensions of space-time as the system of directional vectors from one point, in our model can only be accepted in certain conventions. As will be shown below, in reduction to the usual processes of movement in space, our model is fully consistent with what has been accepted in physics, but applied to the motion of cosmic bodies and electromagnetic processes our model not only has the advantage, but allows us to understand the essence of these processes..
From the equality of elementary states, it follows that with respect to any of the elementary states of the outer part the total number n2 of elementary states of the manifested part is reflected. Thus, the total number of elementary states in the localization is n4, and its (localization) structure is four-dimensional, Fig. 5. The total state of the localization is four-dimensional. The internal elementary state of localization is the elementary state of its realized part. The external elementary state of localization is the elementary state of its outer additional part. The basic matrix of localization states is the total volume of external and internal elementary states of localization. The fact that the localization have complete closed, not only in the space of internal elementary states, but also in the space of external elementary states, means that anything other than itself, for localization in its own relativity does not exist. For comparison, let's pay attention to the fact that a usual Euclidean cube is closed relative to its internal space, but it is not closed relative to the outer for it space, if we consider this outer space to be its complement. But this non-Euclidean four-dimensional structure is closed not only for its internal space, but also for the external, that is, for everything that, in one way or another, is reflected in it and associated with it. It is impossible to imagine this clearly and illustrate in the usual three-dimensional logic of Euclidean spatial perception. Our perception and imagination based on it were formed in a very small segment of this non-Euclidean space, in which it is reduced to Euclidean space, and can not to fully cover it. In accordance with theorem (t2) all elementary states are identical, and in accordance with theorem (t3) this closed non-Euclidean four-dimensional structure must be symmetric with respect to any elementary state. This means that any elementary state in its relativity is at the center of the given structure, and it is completely symmetric with respect to it. Thus, we are dealing with the property of the relativity of the center of a structure in different systems of reference associated with one or another elementary state. From this principle of the relativity of the center of the structure it follows that the distance in any direction from any of the elementary states is the same and is equal to n. This property in the usual Euclidean logic corresponds to a ball, and the size of n could be considered as a radius if the volume of this structure would not be equal n4, which corresponds to a four-dimensional cube with side n. On the other hand, if it were a four-dimensional ball, its maximum transverse dimension would not exceed n, and it turns out that its radius is equal to its diameter. This is the property of a closed non-Euclidean structure of localization in Limitlessness. Regardless of how we imagine this closed non-Euclidean four-dimensional structure: a sphere or a cube, its size, measured from the center to either side, and the overall size from the outside are the same, Fig. 6. Two variants of the conditional schematic image are presented on Fig. 6, since it is impossible to adequately represent this non-Euclidean structure on the drawing plane. Our whole Universe, as localization in Limitlessness, and any elementary particle, as its identical reflection into itself, represents of themselves just such a non-Euclidean closed four-dimensional structure. Since we are accustomed to calling their size the radius, then, paying tribute to tradition, we will continue to calling the basic size of n equal states for each dimension of this structure - the radius. The radius of localization and of its elementary states in internal processes is equal to their external size in external combinations and processes. The primary localization resulting from random fluctuation has a numerical size n=1. Indeed, the primary localization is reflected in its realized part once in each of the two dimensions. The full amount of elementary states of the manifested part is equal to 2, the full amount of elementary states of the entire primary localization is equal to 4, Fig. 7, a). We call the primary localization a zero-order localization. All these four elementary states of primary localization become internal elementary states of localization of the first order, Fig. 7, b). Accordingly, it has two internal elementary states in each dimension of its manifested part. Thus, the numerical size of the localization of the first order is n=2 , and the total number of elementary states, which contains in it n4=24=16 . Further, the structuring process continues of second-order localization, in which all 16 elementary states of first-order localization become its internal elementary states, Fig. 7, c). n = 2(2k-1), where k is the degree of localization or order of it complication stage. As We can see, the increase in size occurs so quickly that there is no reason in calculating further. In the following chapters, we will determine the degree of the base matrix of our Universe and show that the seventh degree is too small for our Universe, and the ninth is too large. But the eighth degree with the main limiting number n = 2128 ideally fits in size and coincides with all known science parameters of our Universe. The static layout of two opposite identical parts of the localization determines its symmetry with respect to Limitlessness. However, in the global system of reference associated with the manifested part of the localization, this manifested part is asymmetric with respect to its additional part. This symmetry breaking is a consequence of the primary choice and in the continuation of the process initiated by it generates the process of symmetry reconstruction. The manifested part begins to move towards its additional part, because only their complete fusion will restore the symmetry that has been broken by the result of primary choice. However, the very fact of the emergence of an unlimited chain of localizations with a consistently increasing degree of the base matrix indicates the impossibility of complete restoration of the broken symmetry. We can only talk about consistent cycles of the process of recovery symmetry. The symmetry recovery cycle is the process of symmetry reconstruction in each successive stage (cycle) of localization, initially disturbed by random fluctuation. Thus, the symmetry recovery cycle is an inexorable process, predetermined by the very fact of the existence of localization, as an occasional fluctuation in Limitlessness. This is the main fundamental basis of all physical processes and forces acting in the Universe. The manifested part of the localization is the realized part of the localization. A negative-potential addition of localization is a symmetric addition to the realized part of the localization. Since the cycle of the restoration of symmetry represents the movement of the manifested part of the localization to its negative potential addition, and the manifested part is its complete state with respect to one of the external elementary states, this motion is a successive transition of the total state of the manifested part through external elementary states of the negative-potential addition. This process of transition of the complete set of internal elementary states of localization through external elementary states determines what we are accustomed to perceive as time. The time is a sequence of complete realized localization states replacing each other in the process of transition of the complete set of internal elementary states of localization through external elementary states under the influence of the symmetry recovery cycle. In essence, this movement in time of the manifested part of the localization, Fig. 8,a) is a process of sequential directional displacement along the radial measurement of two-dimensional structure of external states and the process of expansion according to its angular measurement, Fig. 8,b). However, the whole process is symmetrical, and it cannot be expressed by any directed vector in space-time. That is why the entire two-dimensional structure of external states can be considered as a two-dimensional time structure. A two-dimensional structure of time is the two-dimensional structure of external elementary states of localization. Each realized complete state of localization in a sequence of time is the minimum interval that allows determining the cause-effect relationships. Processes within that interval are relative and not linked by a rigid time sequence. Single-moment state is defined as every realized complete state of localization in a sequence of time. The dynamic component of the localization is the complete set of its internal elementary states of the total single-moment state, which successively transition through external elementary states under the influence of the symmetry recovery cycle. Let's pay attention to the fact that the entire time of the previous cycle becomes the initial single-moment state in the subsequent cycle! It is the initial single-moment state in each cycle of base matrix that is what in modern physics is called the "moment of the Big Explosion". As we have already established, each elementary state in its own relativity is at the center of the entire closed non-Euclidean localization structure. From this, we can conclude that if the set of elementary states in its totality is much smaller than the size of the entire dynamic component, then this set can be considered as a local reference system with certain local properties. A local reference system is a system of reference associated with a number of elementary states located within a radius much smaller than the radius of the dynamic component of localization. In Fig. 9, a) depicts the process of reconstructing the symmetry in the localization relative to the global frame of reference. In Fig. 9, b) depicts the same process relative to the local reference frame. For each such particular case, the basic direction of motion, or the vector of physical time, is clearly defined. The measurement (vector) of physical time is the displacement vector of the local reference system along the radial measurement of the two-dimensional time structure. The measurement of the potential time is called the angular measurement of the two-dimensional time structure in the local reference system, perpendicular to the vector of physical time. It should be emphasized that the local reference system, in its relativity, is at the center of localization and, therefore, in this relativity, the entire dynamic component of localization moves with it in one direction along the vector of physical time and expanding along the measurement of the potential time. However, this direction of movement of the dynamic component along the physical time vector in four-dimensional space-time and the direction of time as a sequence of single-moment states from the past to the future are different qualities of the process and they cannot be confused! The direction of the time vector and the direction from the past to the future are different qualities and not identical with each other! In relative systems of reference, the direction of the physical time vector can vary up to the opposite one, but, irrespective of this, the direction from the past to the future is invariable. We draw attention to the fact that if the movement in the physical time of the dynamic component in the entire set of its internal elementary states is carried out as a consecutive transition over the external states of physical time measurement, then any movement of the internal elementary states along measuring the potential time is carried out inside the expanding dynamic component. Thus, we have the projection rtd of the closed measurement of the potential time td, as measurements of the structure of external elementary states, into the closed internal space of the dynamic component, or internal elementary states, Fig. 10. This projection of measuring of the potential time into the internal space of the dynamic component defines an additional third dimension to its two internal dimensions. The projection of measuring of the potential time together with two dimensions of the two-dimensional structure of the internal elementary states makes up three dimensions of the internal space of the dynamic component of the localization. Принцип The principle of symmetry determines the identity of the processes caused by the symmetry recovery cycle in all three spatial dimensions. This means that with respect to any internal elementary state, its size for each dimension of the two-dimensional structure of internal elementary states is constantly increasing in exact correspondence with the increasing its size along the measurement of potential time. That is, the size of the real elementary state, in the reference system associated with it, is the same in all three dimensions of the expanse and increases in the course of time. It should also be taken into account that all possible dimensions of Limitlessness are identical. The same is true for localization measurements. Differences in the measurements of the space-time of localization are manifested only in the relativity of the system of reference associated with various physical objects. We draw attention to the fact that we, through logical analysis, proceeding from the fundamental postulate of Limitlessness, concluded that the space of objective physical existence is a closed non-Euclidean four-dimensional structure, which in local reduction is a three-dimensional space with the fourth dimension of time. Thus, we succeeded in revealing one of the main mysteries of physical existence, consisting in the fact of the three-dimensionality of physical space. Physical space is the internal space of the dynamic component of localization, defined by the two-dimensional structure of the internal elementary states in combination with the projection of the measurement of the potential time, which together comprise three identical measurements of space. It should be emphasized that the concept of measurement in this case is not identical to the concept of a directed measurement vector! The representation of a physical space in the form of three mutually perpendicular vectors intersecting in one point, is a convenient habit of our perception, but does not always correspond to the objective nature of the physical process. Only one of the measurements of space is radial. The second internal measurement and the third - the projection of the measurement of the potential time - are angular, which is reflected in the equilibrium of the mutual circular motion of the cosmic bodies, and as will be shown later, in electromagnetic processes. Proceeding from the fact that the size of the single-moment state of the dynamic component of localization along the physical time vector corresponds to the size of the external elementary state of localization, we define this size as a unit of time, Fig. 11. The unit of temporal extent s the size of the external elementary state corresponding to the single-moment interval in the sequence of time, measurable in units of time and denoted by dt . During this unit time interval, the dynamic component of the localization is displaced along the symmetry recovery cycle upon one external elementary state, that is, the spatial interval equal to its size. The unit of spatial extent is the size of the external elementary state, equal to the spatial displacement of the dynamic component of the localization during one single-moment interval, measurable in units of length and denoted by dr . It is important circumstance that the time interval during which localization can accurately determine its elementary states, that is, to measure itself, is always equal to one external elementary state in physical time dimension dt ((single-moment interval), or to an integer number of such states. Any attempts to measure the sequence of processes in a time interval that is shorter than dt will be relative and give a conditional-probabilistic result. This follows from the fact that in a smaller time interval than dt , all events are not connected by a strict sequence and are single-moment. It is similarly, with the unit of spatial extent dr . This is the minimum size of the spatial extent, which can be measured with a single-valued result. Measuring of dimensions smaller than this spatial interval is possible only as statistically averaged within a given probability, depending on the method of measurement. Let us denote the number of single-moment state, through which the symmetry recovery cycle have passed, nt. At the same speed, c = dr /dt, the dynamic component of the localization is expanded along the measurement of the potential time. Taking into account the identity of all measurements, the size of the dynamic component of localization in three dimensions of space will increase similarly with the speed c = dr /dt and at each instant will be the same and equal to Rt = ntdr. However, at the same time for each of the two internal dimensions of the dynamic component of localization, exactly n вinternal elementary states always fit. Thus, the size of one internal elementary state is equal to Rt/n. Let us denote the size of the internal elementary state as rn. Tn = ndt (04), where Tn is the time of the complete cycle of localization. Rn = ndr = n2rn /nt (05), where Rn is the radius of the complete cycle of localization. Now let us try to understand how the rate of expansion of the dynamic component of the localization changes during a sequential transition through the cycles. 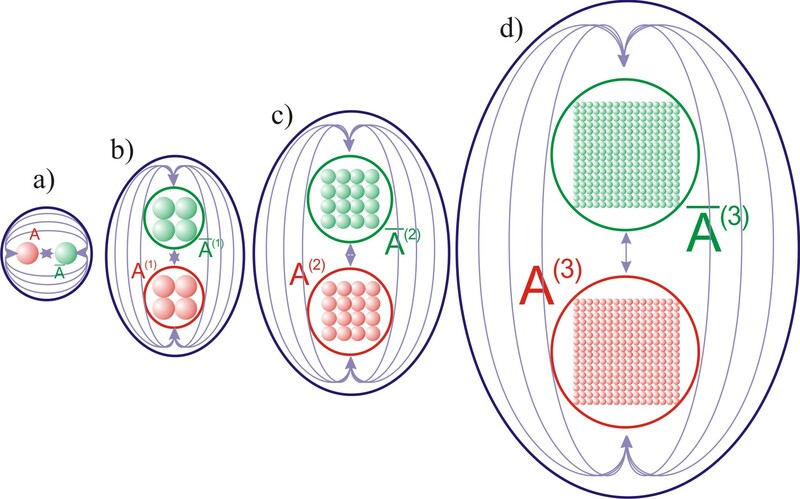 This means that the speed of dynamic component of localization in the evolution process is a Universal constant not only for one cycle, but also for the whole sequence of base matrices. The velocity of the dynamic component of the localization in Limitlessness along the symmetry recovery cycle is a universal constant and does not depend on the numerical size of the cycle. The internal elementary state is a completely identical part of the localization, that is, it reflects the entire main cycle into itself. It is the entire localization with its total radius Rn = ndr, and not just its dynamic component. 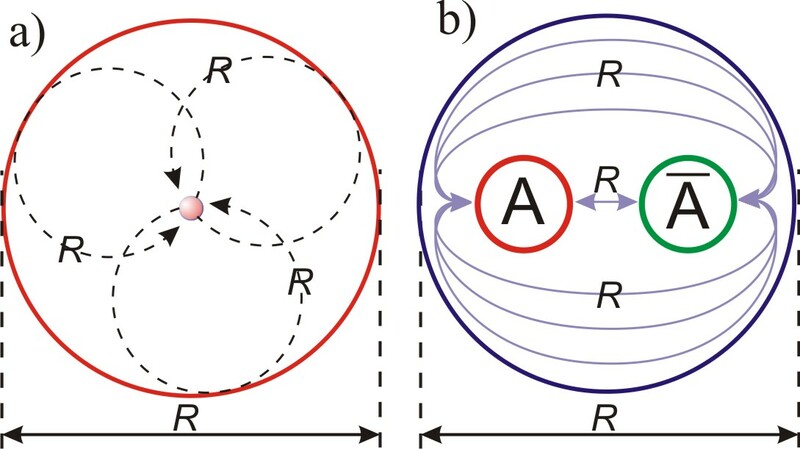 This means that the internal elementary state of localization must have two radiuses, one of which is total radius of its own localization as a whole, the other is the radius of its dynamic component, Fig.12. The radius rn, in turn, denotes the size of a closed non-Euclidean four-dimensional structure in which the internal symmetry recovery cycle of the internal elementary state is realized. From the principle of identity this structure and Limitlessness, there cannot be a dedicated location or center in it. This means that the dynamic component of the internal elementary state can be found with equal probability at any point of this closed non-Euclidean four-dimensional structure. Based on this, we can call the radius rn the radius of finding the dynamic component of the internal elementary state. The radius of location the internal elementary state is the linear dimension of the region of physical space, at any point of which the dynamic component of a given elementary state can be found with equal probability. The radius of the dynamic component of the elementary state rt= rnnt/n let's called the physical radius. In situations of direct physical collision, it is that what most often determines the dimensions of the elementary state, and, in a certain convention, may well be considered the physical radius of the internal elementary state. The physical radius of an internal elementary state is the radius of the dynamic component of its own localization. Since we have no reason to assume any external conditions of other localization, in which our Universe exists, we can fully believe that our Universe is an independent localization passing a certain cycle of its base matrix. The objective physical Universe perceived by us is a dynamic component of its localization. The Universe, as an objective material phenomenon, is a dynamic component of its own localization in Limitlessness. The dynamic component of localization, which is its manifested part, is a material phenomenon in the internal relativity of localization. We call this phenomenon matter. Matter is the dynamic component of the localization, as an objective phenomenon in the internal relativity of localization in the process of the symmetry recovery cycle. Since Genesis takes place in a local system of reference, inside a dynamic component, exactly the internal relations of the manifested part of localization determine the laws of the physical world. The physical world is the totality of objective material processes in the internal relativity of the dynamic component of the localization of the Universe. In this relativity, the dynamic component is entirely matter, and since it consists of a certain number of its elementary states, the amount of matter in it is determined by the sum of the amount of matter in the internal elementary states. A set of internal elementary states and their parts form physical objects. A physical object is a part of the dynamic component of localization, formed by a certain number of internal elementary states and their parts. The quantity of matter in a physical object is the total amount of matter in the internal elementary states and their parts, of which it consists. u = nidu , where u is the amount of matter in the object, du is the amount of matter in one internal elementary state, ni is the number of elementary states constituting the physical object. U = n2du= const (09), where U – the amount of matter in the Universe (the dynamic component of localization). Any movement is a change of states of the dynamic component of localization. Accordingly, in the relativity of each internal elementary state, its motion is always carried out along the two-dimensional structure of external elementary states, that is, in time, together with the entire dynamic component. Thus, the movement inside the dynamic component is carried out along the measurement of the potential time. The measurement of the potential time relative to each moving physical object in physical space always coincides with the direction of its movement. The reference system, associated with any internal elementary state, regardless of its motion in the physical space with respect to other internal elementary states, always moves along the physical time vector in the global reference system with a constant speed c = dr /dt. The inertial position of the angular measurement of a potential time is its position, tied to the average motion of all internal elementary states along this dimension. From this definition, it follows that the dynamic component of localization, as an integral phenomenon, is always in an inertial position. As we have already established, the motion of the dynamic component along the symmetry recovery cycle is determined by the influence of the state of the broken symmetry. We call this action the force of the symmetry recovery cycle. The force of the symmetry recovery cycle (hereinafter - the force of the cycle) is the influence of the state of broken symmetry. The force of the main cycle causes uniform motion of the dynamic component of localization along the physical time vector with the speed c = dr /dt. In a physical space, local symmetry breaking is possible due to the mutual arrangement of the internal elementary states with respect to each other. This leads to the appearance of the symmetry recovery cycle and the forces corresponding to them. All causes of motion of physical objects in physical space due to one or another symmetry recovery cycle. A physical force is the force of a symmetry recovery cycle that gives motion to a physical object in a two-dimensional time structure. Ft = n2ft (10), where Ft – is the force of the main cycle acting on the dynamic component of localization along the physical time vector, ft - is the force of the main cycle acting on one internal elementary state. p = uv (11), where p is the amount of motion, v is the speed of the object, u is the quantity of matter in the object. Pt = cU = cn2du = const (12), where U – the total amount of matter in localization. The physical movement of elementary states along the measurement of the potential time in the local reference system is identical to their motion along the physical time vector in the global reference system. f = nifi, where f – is the force of local cycle which acting on the physical object, fi - is the force of local cycle which acting on one internal elementary state, and ni is the number of elementary states in the given object. However, the identity of the principle of motion and the action of force about two external dimensions do not mean the equality of the conditions in which they occur, according to these dimensions. The motion of the dynamic component of localization along the main cycle in Limitlessness does not have an external reference point and occurs only with respect to the global reference system, which is an internal localization function. In this internal relativity of localization, the motion of its dynamic component in each single-moment interval is no different. Thus, this motion cannot accumulate, as a certain physical quantity. The movement of physical objects along the projection of the measurement of potential time into the dynamic component has a specific quantitative relation to the entire dynamic component of the localization. The uncertainty of the origin of the angular measurement relative to any internal elementary state does not mean arbitrariness. The random motion of one elementary state creates a precedent for fixing the count for another elementary state. Thus, there is interaction of the mutual motion of the internal elementary states, which determines the inertia forces. Forces of inertia are the forces caused by the influence of the motion of internal elementary states along the angular measurement at each other. p = nipi, where p is the amount of motion gained during the time t = nidt of the force action, pi is the amount of motion imparted by the force at the single-moment interval. If in a single-moment interval, under the influence of a certain force, a certain speed was achieved, then this speed is transferred to the next single-moment interval, and if the force ceases to act, then the speed remains unchanged in the next single-moment interval. If the force continues to act in the subsequent single-moment interval, then the speed achieved in it is added to the speed of the previous single-moment interval. Thus, we have a uniformly accelerated motion of a physical object under the action of physical force in physical space. The fact that the uniformly accelerated motion is composed of motions recruited at one-time intervals does not mean that the amount of motion increases jumpwise at single-moment intervals. As we have already noted, processes inside a single-moment interval are relative and cannot be unambiguously expressed by successive functions. In the relativity of motion along the physical time vector in the global reference system, the force of the cycle causes inside the single-moment interval a uniform translational motion. In the relativity of motion along the measurement of the potential time in the local reference system, the force of the cycle causes inside the single-moment interval a uniformly accelerated motion. f = uv/t = ua (14), where a = v/t - the acceleration imparted by the force. ft = pt/dt , where pt - the constant amount of motion along the physical time vector. pt = dudr/dt = cdu (15), where du – the amount of matter in one internal elementary state. One physical object relative to another physical object is asymmetric, which creates a precedent of symmetry breaking in the localization. This violation causes a symmetry recovery cycle, identical to the basic cycle. It is identical in accordance with the theorem (t2), since in itself it is part of the localization. Let us call this phenomenon gravity. Gravity is the process of restoring the symmetry broken one physical object in relation to another. The difference between the gravitational cycle and the main one is that the gravitational cycle is a consequence of symmetry breaking inside the dynamic component of localization, that is, it is a "sub cycle" or a secondary cycle. Sub localization is localization, which exists in conditions of restriction of other localization. Parental localization with respect to sub localization is the localization, under the constraints of which this sub localization exists. Thus, if the force of the main cycle is produced by Limitlessness, then the force of the gravitational cycle, as sub localization, is produced from the condition of constraints of the main localization. Limitlessness can be seen as its reflection in itself in the quantity of one time. From this it follows that Limitlessness, as a certain substance in which localizations are realized as a consequence of random fluctuations, can be considered as a parental localization of a numerical dimension n = 1. Thus, it turns out that the restriction of Limitlessness by the number 1 does not affect the possibility of Limitlessness to produce the force of a cycle , giving the velocity c = dr/dt of the dynamic component of the main localization. But localizations with a greater than one numerical size are limited in Limitlessness and, accordingly, can produce a smaller force of cycles of sub localizations realized in them. On the other hand, the more times localization is reflected in each of its dimensions, the less is the power of such reflection. However, since localization is identical to its reflections (elementary states), then, accordingly, the power of all localization in relation to the production of the force of sub cycles is less. Thus, we can draw a conclusion about the inversely proportional linear dependence of the localization ability to produce the force of sub cycles of symmetry recovery from its numerical size. Since, as we have already established, the velocity of the dynamic component of the localization in Limitlessness does not depend on its numerical size, we can regard this speed as equivalent to the power of the external conditions (parent localization) in which the symmetry recovery cycle passes. v = c/n , where v – the velocity of the dynamic component of the sub localization along its own physical time vector, n is the numerical size of the parent localization. Thus, the gravitational cycle, as sub localization, is completely identical to the main cycle in its motion along the physical time vector, only causes the velocity of its dynamic component to be n times smaller than the main cycle. The symmetry recovery cycle of sub localization in the parental localization of numerical size n causes force n times less than the force of the main cycle, what acting on its dynamic component along the physical time vector. However, it is necessary to take into account one more condition. The main cycle takes place under conditions of a closed non-Euclidean structure, but a gravitational cycle takes place in the plane of the Euclidean space. The total size of the main cycle under conditions of a closed non-Euclidean structure is equal to its radius, but in the projection onto the plane of the Euclidean space corresponds to the size of the circle. 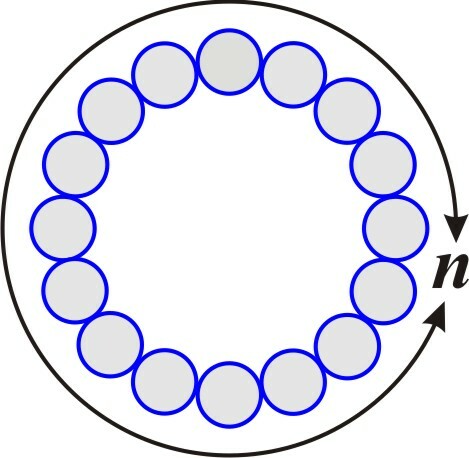 Under the conditions of Euclidean space, the motion is carried out along the diameter of this circle, the size of which corresponds to the size of the complete cycle. Thus, the circumference is projected as its diameter, and the linear dimension of the complete cycle in its Euclidean projection is reduced by a factor of π. As a result of this reduction, the magnitude of the projection of the acceleration and, accordingly, of the force causing it, into the Euclidean space will be π times as large as their value in the conditions of the main cycle. fg = πft/n (18), where ft – force of the main cycle along the physical time vector. But this formula corresponds to a complete sub cycle. For a complete cycle with a numerical size nr, at the opposite pole there should be nr2 external elementary states. 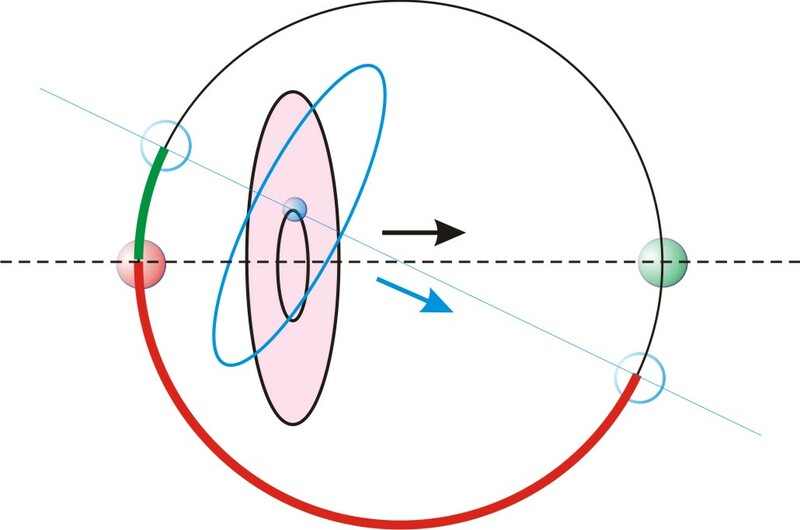 In the gravitational interaction of two internal elementary states, one for the other is the external opposite pole, or a negative-potential complement. Thus, the force of the gravitational interaction of two elementary states, as an incomplete sub cycle, will be in nr2 less than the strength of the complete sub cycle, Fig. 13.
fg = πft/nnr2 (19), where nr - the numerical size of the gravitational cycle. nr = rg/rn (20), where rg - radius of the gravitational cycle, rn - is the radius of the elementary state. rg = πR, where R - is the distance between the interacting internal elementary states. Considering that physical objects consist of elementary states and their parts, we can express the force of the gravitational attraction of two physical objects through the amount of matter in them. The force of the gravitational attraction between two physical objects will be as many times greater than the force of attraction of two internal elementary states, how many times more the number of elementary States in each of them. fg12 = (u1/du)(u2/du)fg= u1u2fg/du2, where u1 и u2 – the amount of matter in interacting physical objects. fg12 = Gm1m2/R2, where G – the gravitational constant. As we can see, the formulas are identical, with the only difference being that we use the concept of "quantity of matter", and in physics the concept of mass is used. In modern physics, the concept of physical mass refers to three different physical qualities, such as gravitational mass, inertial mass and energy mass (energy equivalent). These qualities are considered identical due to experiments and theoretical constructions of modern physics. From our theory, we can conclude that all three qualities of a mass are proportional to the amount of matter, but we will not hurry to conclude about their equivalence with each other. The question of gravitational and inertial masses is solved quite simply. These qualities are identical, because they are a consequence of the process of restoring symmetry along measuring the potential time, and depend on the amount of matter and the ratio of the sizes of the internal elementary states to the dimensions of the main cycle. Since the second is invariable, it is possible to equate the gravitational and inertial masses with the quantity of matter. The mass of a physical object is a physical quantity that determines its gravitational and inertial properties and reflects the amount of matter in it. The question of mass, as the equivalent of energy, we will consider later. fg12 = u1u2c2drnt2/πduR2n3 = m1m2c2drnt2/πdmR2n3 (26), where dm – mass of the internal elementary state, m1 и m2 – masses of interacting physical objects. The force of the gravitational attraction of two masses increases in proportion to the square of the number of single-moment states passed by the Universe. Nevertheless, this does not mean that we will determine this increase in force in physical experience. The point is that the measure of length (similarly, the measure of time) used in modern physics, based on a physical standard, is not a constant, but increases in proportion to the number of single-moment states passed by the Universe, Fig. 14. R1 = kR/nt, where k - coefficient of conversion of measures, expressed as a dimensionless number. k = nt0 (27), where nt0 – the number of single-moment states passed by the Universe to the present time. In this case, we will give an "absolute" measure of length into conformance to the modern physical measure. Since the change of nt is much smaller than its value for tens of years, we can easily take nt0 as some physical constant reflecting the stage of development of the Universe in which we are. Thus, the force acting between two physical objects does not depend on the process of expansion of the Universe, since the increase in the attraction force is compensated by the increase in the distance between these objects due to this expansion. As a result of the expansion of the universe, changing the physical measure of length compensates for the change in gravitational force. Thus, the gravitational cycles that balance the motion of cosmic bodies do not change, and we do not notice the expansion of the Universe, except for the "red shift" effect. However, modern physics does not take into account the constant expansion of the Universe and the corresponding increase in the physical standard measure of length. R1 = nt0R/nt, where R1 – the distance measured with the physical reference unit of length, R – distance measured with the "absolute" unit of length. Energy is the product of the force at the distance of the displacement of a physical object under the action of this force, inversely proportional to the number of single-moment states passed by the Universe. The coefficient nt0 in the formula, equal to the number of single-moment states passed by the Universe to present time (27), determines its reduction to modern physical measures of length. Let us pay attention to the fact that, as we have already established, the force of gravitational attraction of two objects does not change despite the fact that the distance between them increases due to the expansion of the Universe. Consequently, when applying this formula of energy values, the total sum of all the gravitational cycles, that is, the total energy of the Universe remains unchanged in the symmetry recovery cycle. Thus, the law of conservation of energy is fulfilled. The energy of the Universe is constant and does not change over time. Mass, as the equivalent of energy, corresponds to the amount of matter and, consequently, is equivalent to gravitational and inertial masses. Since the single-moment state of the dynamic component of localization is its total state at a certain point in time, the given magnitude of energy is the total value of the energy of the internal elementary state, as a material object, that is, it is the energy of its mass. Equivalence of energy and mass is expressed by the formula: E = mc2 . Again, our model gives a result corresponding to known physical relationships. The internal symmetry recovery cycle of the internal elementary state is an integral part of the main cycle and is completely identical to it in the relativity of its own sizes. This means that at a low speed of movement of the internal elementary state relative to the inertial position of the local reference system, its own measurements tu1 and td1 coincide with the basic measurements of tu and td, Fig. 15, a). At high speeds of the internal elementary state, its own physical time vector tu1 shifts relative to the physical time vector of the local reference system tu, Fig. 15, b). As a result, the projection of motion of the dynamic component of the internal elementary state along the inner cycle appears on the main measurement of the potential time td. Under conditions of motion along the main measurement of the potential time of the local reference system, the internal motion of the dynamic component of the internal elementary state begins to accumulate in the uniformly accelerated motion. This leads to the fact that in a short period of time the velocity of the dynamic component of the internal elementary state along the main measurement of the potential time of the local reference system increases to such an extent that the internal elementary state decays, Fig. 15, c). In this case, a complete reorientation of the intrinsic measurements of the two-dimensional time structure of the decaying internal elementary state occurs in such a way that its own physical time vector tu1 coincides with the main measurement of the potential time td of the local reference system. In more detail, we consider this decay of the internal elementary state and the characteristics of the decay parts in the chapter "Elementary Particles," and now consider the interaction of the two main parts of the decay, reflecting in their behavior the forces of internal interaction of the dynamic component and its negative-potential complement. Let us call a part of the elementary state that reflects the properties of the dynamic component - the positive charge, and the other part, which reflects the properties of the negative-potential complement - the negative charge. A single positive charge is a physical quantity that reflects the properties of the dynamic component of the elementary state in its interaction with the negative potential complement after the decay. A single negative charge is a physical quantity that reflects the properties of the negative-potential complement of the elementary state in its interaction with the dynamic component after the decay. The forces due to the interaction of the dynamic component of the internal elementary state with its negative potential complement, manifested after its decay, are called electric forces, and the process of interaction of the opposite parts of the decay is called the electric interaction. An electrical interaction is the interaction of the having charge parts of internal elementary state, separated along the measurement of potential time, due to the projection of the inner symmetry recovery cycle of the elementary state into the dynamic component of the main cycle. As a result of the decay of the internal elementary state, its internal symmetry recovery cycle is projected into the space of the dynamic component of the main cycle with motion along the measurement of potential time. Since this local cycle of electrical interaction passes under the conditions of Euclidean space, then similarly to the gravitational cycle, the force of the electric interaction cycle will be π times over the force projected from the force that causes the acceleration of its dynamic component along the inner cycle. Since the size of the main cycle is n times over the size of the inner cycle of the internal elementary state, the projection of the force from the inner cycle to the outer one will be n times larger. fe = πnfu/nr2 (36), where fu – the force acting on the dynamic component of the elementary state in the inner cycle along the physical time vector before the decay process, nr - the numerical size of the cycle of electrical interaction. 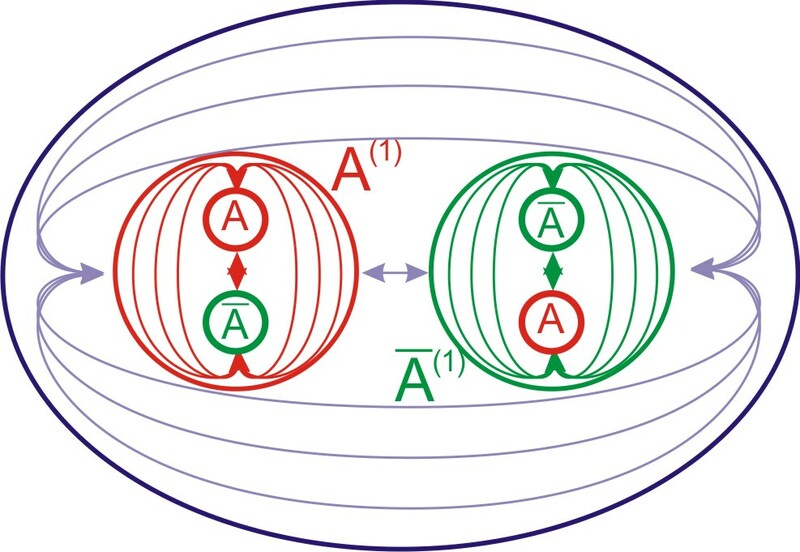 By the principle of identity with the main cycle, the numerical size of the cycle of electrical interaction is determined by the number of internal elementary states that fit within its radius, Fig. 16.
nr = re/rn , where re - the radius of the cycle of electrical interaction. re = πR, where R - the distance between the interacting charges. fu = dmvt/dt , where vt – the velocity of the dynamic component of the internal elementary state in the inner cycle along the physical time vector. fe12 = (q1/q0)(q2/q0)fe = q1q2fe/q02 = q1q2dmc2drnt3/πq02R2n3 (41), where q0 - unit charge, q1 and q2 - interacting charges. fe12 = Qq1q2/R12 , where Q - electric constant, R1 - the distance between charges, measured by the physical measure of length. As we can see, the electric constant relatively to the physical world, which increasing in its dimensions together with the expansion of the Universe, grows in proportion to the number of single-moment intervals passed by the Universe. This does not affect the structure of the atoms, which is depends, as will be shown below, of the radius of finding of the elementary state, which increases in proportion to the expansion of the Universe. The growth of electric forces is manifested only in the electric effects of the interaction of charged particles. It is easy to guess that the elementary state of the Universe is a neutron. First, it is a neutral elementary particle that decays into oppositely charged protons and electrons. Secondly, the neutron, together with the proton and the electron, to which it decays, form the basis of all the material substances of our physical world. Further, we will show by calculations that the ratios of the dimensions of the neutron, as an internal elementary state, and the Universe, as a dynamic component of localization in Limitlessness, fit exactly into our theoretical model. However, it is important to take into account the circumstance that a neutron, regarded as a material elementary particle and the concept of an "internal elementary state" are not identical in all senses. The neutron, as a particle, is a physical manifestation of the dynamic component of the internal elementary state. But in combination with its radius of location reflects the properties of the internal elementary state of localization in its integrity. The resulting expression gives us the opportunity to compare our theoretical model with the real Universe, considering it a localization in Limitlessness with an elementary state - a neutron. rt0 = πdmnG/c2 (46), where rt0 – the physical radius of a neutron, in the modern stage of the development of the Universe. Let us verify the relation by substituting in the formula the neutron mass as dm. It turns out that the value is too small, twenty orders of magnitude smaller than the real radius of the neutron. Calculating for a cycle of the ninth degree already does not make sense, since the value of rt0 in this case will exceed that obtained by 38 orders, which will be commensurate with the dimensions of the entire Universe. Our Universe is a localization in Limitlessness with a numerical size of n = 2128 , and its internal elementary state, completely identical to it, is a neutron. From the assumption that the internal elementary state of our Universe is a neutron, it is quite logical that two parts separated in electrical interaction are a proton and an electron..
From the formulas that we derived for gravitational and electrical interaction, it is not difficult to find the value of nt0 - the single-moment states passed by our Universe. where Q - electric constant, G - гgravitational constant, q0 - unit charge, dm - neutron mass. Based on the obtained value, we calculate the main characteristics of the Universe and compare it with the known sciences. As you can see, this result is fully consistent with modern scientific data. The approximate value for this removal is experimentally set at - 60 000 000 м/с. According to approximate calculations of modern physics, the density of baryonic matter - wb = 4,9•10-28kg/m3 . We have already noted that the decay of the internal elementary state is due to the reorientation of its own measurements of the two-dimensional time structure in such a way that its own physical time vector coincides with the measurement of the potential time of the local reference system, and vice versa, its own measurement of the potential time coincides with the physical time vector local reference system. Each of the divided parts, as part of the internal elementary state, by the theorem (t2) must be completely identical to it and, consequently, to all localization. Let us call the parts of the divided elementary state elementary particles. Elementary particles are parts of the elementary state (the neutron), divided along the measurement of the potential time of the local reference system. dentity means that all internal relationships into elementary particles should be exactly the same as for a neutron, including the ratio of the physical radius and the radius of the finding. We emphasize that the principle of identity extends to the internal relationships of each of the elementary particles, but not to their relations with the entire localization and with each other. Accordingly, like a neutron, elementary particles must have two radiuses: the radius of location and the physical radius. Based on the principle of the constancy of the amount of mass (energy), the total mass of the separated parts should equal the mass of the neutron. This means that the elementary particles have a mass smaller than the neutron mass. By the principle of identity to the internal elementary state, each elementary particle in its own relativity should represent a complete elementary state of the nominal cycle with a radius of the dynamic component along the measurement of the potential time Rti, Fig. 17. Rti = nrni , where rni - рthe radius of location of the elementary particles. dri = rnin/nt , where dri – the size of own relative single-moment interval of the particle in units of length. dti = dtrni/rn , where dti – the size of own relative single-moment interval of the particle in units of time. fti = dmcrn/rnidt = (dmrn/rni)(c/dt) = dmic/dt , where dmi – mass of a particle. The mass of an elementary particle is inversely proportional to its radius of location. The proton is an elementary particle, resulting from the decay of a neutron, and carrying a positive charge. Since the proton takes over all the properties of the dynamic component of the neutron, its mass is close to the mass of the neutron. 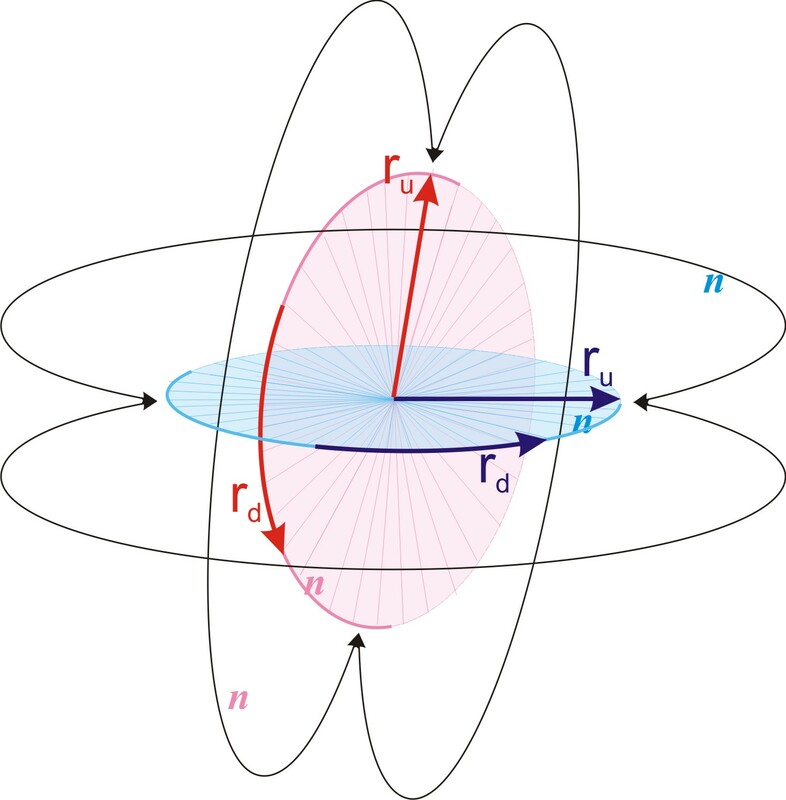 rne = rndm/dme , where rne – radius of location of the electron, dme - mass of a electron. These dimensions, and especially the large radius of location, provide the wave properties to the electron, and determine the dimensions of the atoms that are commensurate with its radius of location. Essentially, the electron in the atom does not move, but is simply statistically located in a certain radius around the nucleus. The radius of the electron's location determines the dimensions of the atoms. The radiuses of location of the proton and neutron determine the limiting dimensions of the atomic nuclei. Modern physics does not answer the question of what determines the ratio of the mass of an electron to the mass of a proton. Our model allows us quite confident to give an answer to this question. We have already determined the forces of inertia, as the forces caused by the influence of the motion of internal elementary states along the angular measurement on each other. We recall that the angular measurement is uncertain with respect to the reference point, and in this connection, we have defined the inertial position (d32), which is determined by the averaged motion of all elementary states. In physics, inertial motion is a rectilinear uniform motion. The notion of an inertial reference system is connected with this concept. However, as we see, our model tells us that this view is erroneous, and corresponds to the objective reality only in a certain approximation, on the path segment much smaller than the radius of the circle of uniform motion along the angular measurement of the potential time, when the segment of the circle is indistinguishable from the line segment. The initial unstable equilibrium of the uniform distribution of internal elementary states along the projection of the angular measurement of the potential time causes the process of separation into groups and concentrations of these groups around their center of mass. Each such group is a local reference system. Since all the impulses of the interaction of internal elementary states are within each group individually, the center of mass of each local group is fixed relative to the general inertial position of the dynamic component. This means that the dynamic component is symmetric with respect to each such local center of mass, and it is this local center of mass that can be fully considered a local reference system with all of the conclusions and calculations that we have already done. In sub local reference systems associated with local groups of internal elementary states distant from the center of mass of the main group, this isolated center of mass will always be present, which breaks the symmetrical position of such a group in localization. First, it will cause a gravitational cycle, leading to rotational movement around the center of mass. Secondly, we cannot speak of the movement of the entire dynamic component to its negative-potential complement along the radial measurement passing through such a sub local group. The process of motion of the dynamic component along the symmetry recovery cycle is always symmetric with respect to all other measurements, except measurement of the physical time. Thus, the movement of the entire dynamic component along the radial measurement of physical time always corresponds to the motion of each local group relative to its center of mass along this dimension. This position of the centers of the masses of each local group along the external radial measurement exactly corresponds to their position along the internal radial measurement of the internal space of the dynamic component. 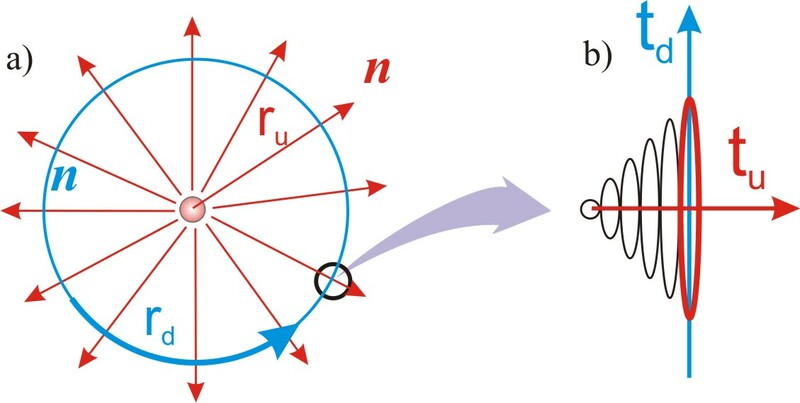 Displacement in physical space along radial measurement with respect to the center of mass of the local group is projected into the external structure of time as a displacement along cycle from the positive pole to the negative one, Fig. 18. The number of passed single-moment states cannot change, and this displacement determines the material manifestation as a displaced and partially projected onto the external negative-potential part. This leads to the fact that in the local reference system, connected with the remote physical object from the center of mass of the local group, the negative-potential addition of localization in the projection into the internal elementary state acquires its material being in proportion to this removal. 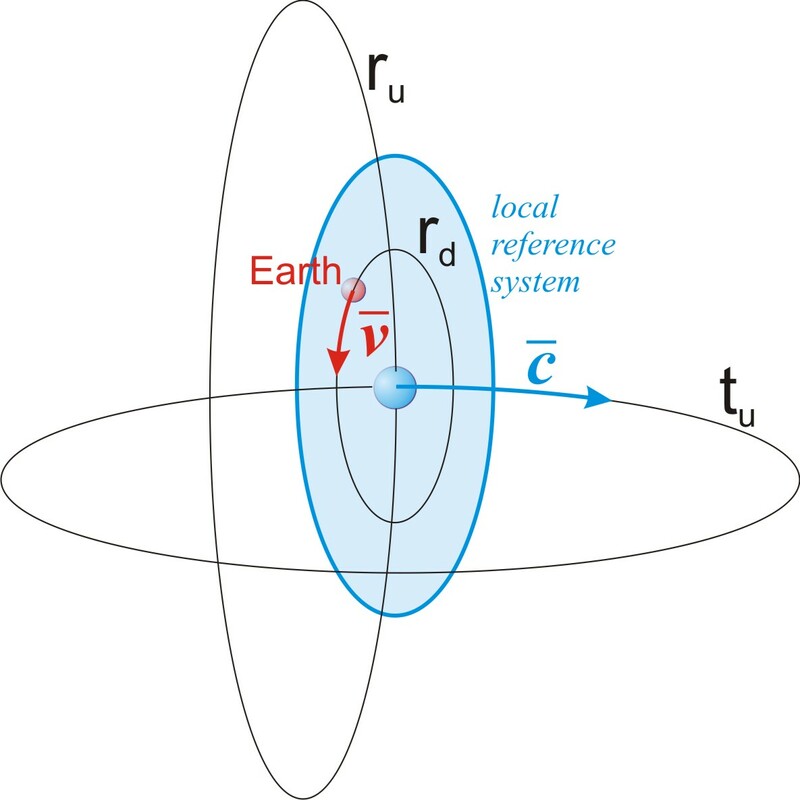 The ratio of the masses of an electron and a proton is determined by the displacement of the sub local reference system, connected with the Earth, relative to the center of mass of the main local group. Relatively the reference system associated with the Earth, the separation of all internal elementary states of the dynamic component of the localization is projected as a separation into a proton and an electron with the same mass ratio. Thus, observing cosmic objects from the Earth, we will everywhere find exactly the same characteristics of the atomic structure of matter as it is on Earth. However, when the reference system is moved to a sufficiently large distance to what we perceive as the "center of mass of the Universe", all the characteristics of elementary particles and the atomic state of the substances will change! We can calculate the exact value of displacement, or the radius of the circle along which our planet is moving relative to a certain center of mass in the Universe, which defines our local group of cosmic objects. Rz = Rt0me/mp , where Rz – the radius of the Earth's orbit relative to the center of mass of the local group, me - mass of the electron, mp - mass of the proton. At very low speeds of physical objects in physical space relative to each other, in comparison with the speed along the cycle c = dr/dt, their relative physical time vectors coincide. 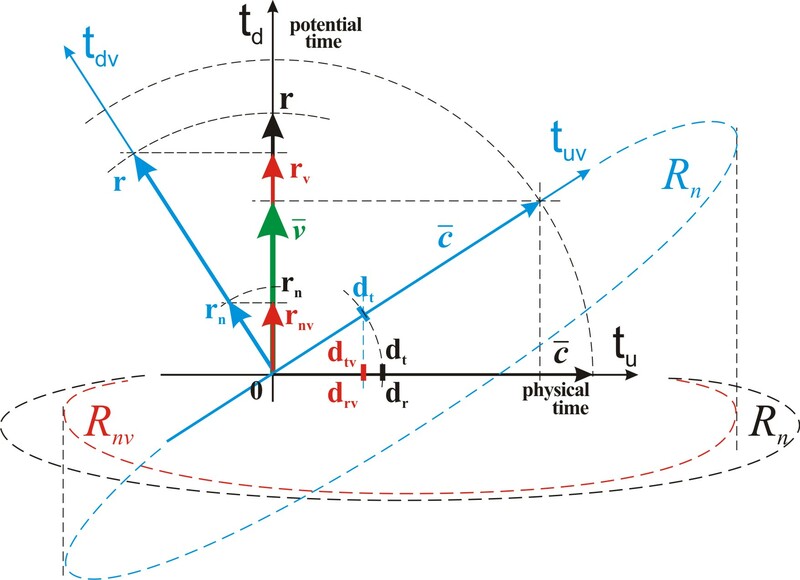 In the case of a high speed of movement of a material object in physical space, its own relative physical time vector is displaced relative to the physical time vector of the inertial position of the local reference system, Fig. 19. The diagram shows the basic reference system tutd in the two-dimensional time structure, which is in the inertial position. And the reference system tuvtdv moving with respect to it with speed v which connected with a moving physical object. The speed of motion along the own vector of physical time with respect to the global reference system for each such reference system is the same and is equal to c.
c = drv/dtv , where drv – linear size of the own relative single-moment interval of the moving object in units of length, dtv – the size of the own relative single-moment interval of the moving object in units of time. dmv = dmrn/rnv , where dmv – mass of the moving internal elementary state with respect to the inertial position. From this formula it follows that no physical object consisting of internal elementary states of localization, that is, possessing mass, cannot move along the measuring of potential time of the local reference system (in physical space) faster than the speed c.
No physical object with a rest mass can move in physical space at a speed greater than the velocity of the entire dynamic component of the localization along the cycle of symmetry recovery c = dr/dt . Thus, we arrive at the formulas of the relativistic motion already known in physics. However, this does not mean that our model is consistent with all aspects of the principle of relativity adopted in modern physics. So, for example, the statement about the relativity of the flow of time in different reference systems, leading to the so-called "paradox of twins", is erroneous. Only the relative sizes of a single-moment interval are changed, but the time as the number of single-moment intervals nt what Universe have passed is invariant with respect to any reference system! We emphasize that the relativity of the dimensions of a moving body does not affect all linear relations in all reference systems without exception, since all linear dimensions, including the linear dimension of a single-moment time interval, change identically! As for the change in the mass (energy) of the moving physical object relative to the inertial position in the Universe, this change is determined only by this speed, and in no way depends on the reference system, whether we measure on a moving object, or measure, being in another body at rest relative to the inertial position of the object. The elementary particles considered by us move along the basic vector of physical time together with the dynamic component (Universe) and have mass in the absence of motion relative to the inertial position of the local reference system. In physics, this is called the mass of rest. Accordingly, when moving at high velocities, their mass increases, and tends to infinity if their velocity approaches c = dr/dt. We remind you that all elementary particles are the identical projection of the internal elementary state. However, in Limitlessness there are no allocated directions, and in localization all measurements are identical. Therefore, the variant of the particle is not excluded, which fully reflects the situation with the motion of the internal elementary state along the physical time vector, only in motion along the measurement of potential time. Such a particle must move at a speed c relative to the global reference system perpendicular to the physical time vector of the main system. The concept of rest mass for such a particle does not make sense, and its material manifestation, similar to the material manifestation of the internal elementary state in its motion along the basic vector of physical time, consists in its movement along the basic measurement of potential time. Since the measurement of the potential time is angular, that is, uncertain with respect to the origin of the main cycle, two versions of such particles are possible: those reflecting the stage of the main cycle, like all other elementary particles, and reflecting the entire cyclic process in a multiple-accelerated form along the measurement of potential time. Such a particle of the second variant is a photon or quantum of light. Fig. 20. Since the process of the internal symmetry recovery cycle of photon is passing in a non-Euclidean closed structure, the complete cycle of photon consists of a step of expanding the dynamic component of the photon to the full size of its localization rγ or the location radius, and of the subsequent compression stage to the initial size rγ/n. However, we must take into account one more circumstance. 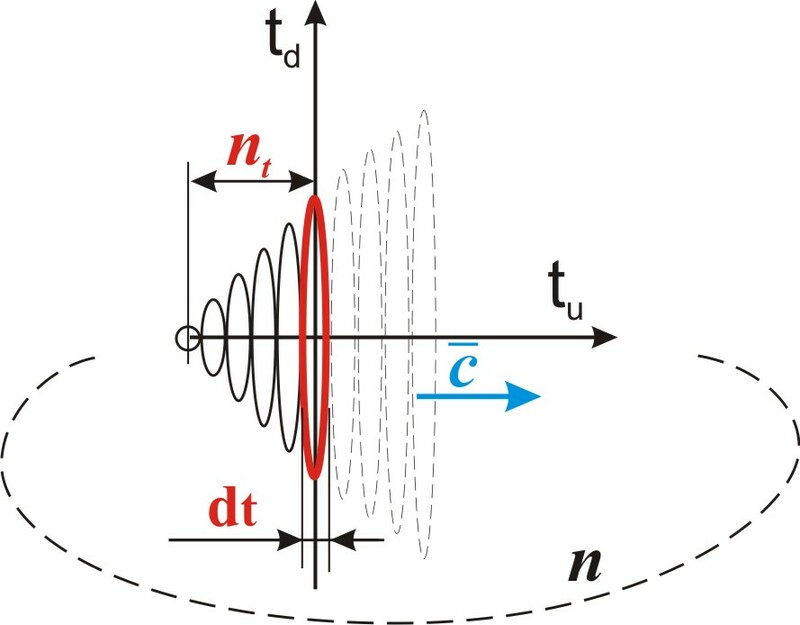 The reorientation of measurements of the own two-dimensional time structure of a photon is identically reflected in its own internal two-dimensional structure, in which the displacement of the measurements likewise occurs. In this case, it turns out that the own radial measurement ru1, having a reference point moves to the internal angular measurement rd of the local reference system. Thus, the internal angular measurement of the main system with respect to the photon acquires a fixed value, which depending of the stage of the main cycle nt. 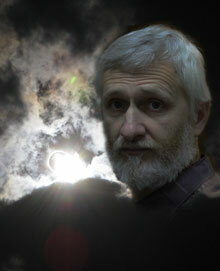 This circumstance determines the property of photon polarization in physical space. The magnitude of the total cycle rγ along the measurement of the potential time is the wavelength of the photon. rγ/tγ = dr/dt = c , where tγ – time of the complete internal cycle of the photon. γt = 1/tγ = c/rγ , where γt – frequency of a photon (quantum of light). The photon in its motion along the measurement of potential time must be identical with the internal elementary state in its motion along the physical time vector of the main cycle. Since the mass of the dynamic component of the main localization does not change during cycling, the same applies to the internal cycle of the photon with respect to the energy of its dynamic component of the inner cycle, which, accordingly, is not depend of the stage of the cycle. Thus, the entire photon cycle along the measurement of potential time, which is its own motion vector, is completely equivalent to an elementary particle with a radius of finding equal to the size of this cycle along a given measurement. Similarly, as for already considered elementary particles, the photon projects from itself a nominal cycle in which it is an elementary state, only with the difference that for a photon this is a cycle of motion along measuring the potential time. 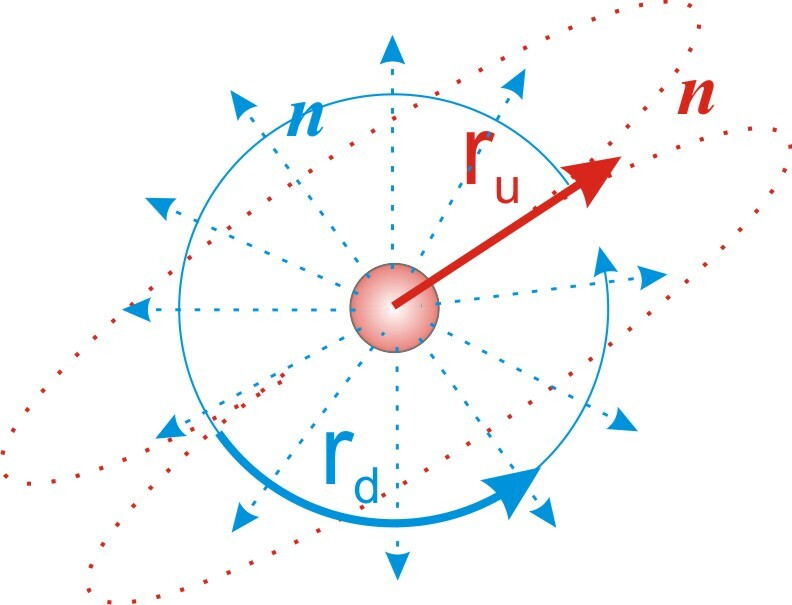 Rnγ = rγn2/nt , where Rnγ is the total radius of the photon's nominal localization. dγt = dγr/c = rγn/ntc = tγn/nt. eγ = hγ, where h - Planck's constant. rγt = rγnt/nt0 , where rγ - the wavelength measured by the physical standard measure of length. The magnitude of the Planck constant, the photon energy, its wavelength and frequency, measured by the physical reference measure of length, remain unchanged throughout the entire cycle of the Universe. A small difference of 0.8% between the exactly calculated value and the experimental value is explained by the speed of the Earth's motion relative to the inertial position of the local reference system. Using this difference, we can exactly calculate this speed. As we have already noted, it follows from our model that the value of energy and mass does not depend of the reference system. This means that the gravitational constant and the Planck constant remain unchanged in all reference systems. Thus, putting in the formula the experimental value of the increased neutron mass in our moving reference system with a high speed, we obtained an overestimated value of the Planck constant. The discrepancy between this value and the experimental data enables us to calculate the increase in the neutron mass, and, consequently, the velocity of the Earth's motion relative to the inertial position of the local group. hv/h = dm2/dm02 = (dm/dm0)2 (81), where hv – the overestimated calculated value of the Planck constant, dm0 - the neutron mass in the inertial position. dm/dm0 = 1/ (1-v2/c2) , where v – the velocity of the Earth around the local center of mass in the Universe. ML = v2Rz/G, where ML – the value of the local center of mass. This is about 1/281 of the total mass of the Universe. As we have already noted, another kind of particles moving with velocity c along the vector of potential time and not having a rest mass is possible. 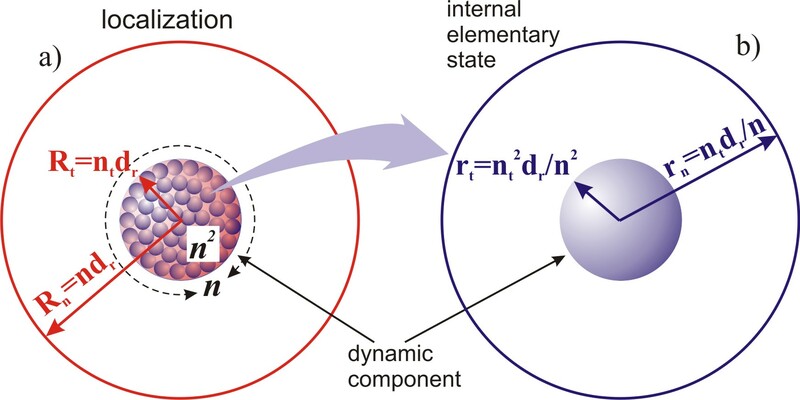 Only in contrast to a photon, this particle reflects, like other elementary particles, the stage of the internal cycle of symmetry recovery of the internal elementary state. That is, it has two radiuses: the physical radius and the radius of location, which are identical to the radiuses of the internal elementary state. With a high degree of probability, it can be assumed that this particle is the neutrino. All the characteristics of such a particle, including energy and the dynamic mass, will be similar to that of a photon. The difference will be only in the absence of wave cycles, and, consequently, the wave properties of the photon. Such a particle must possess all the qualities that a neutrino possesses. Thus, our model helps to understand the nature of neutrinos and to debunk the myth about the existence of neutrinos nonzero rest mass. Modern physics considers baryons (protons and neutrons) as consisting of three sub-particles - quarks. In the experiments, the quarks manifest themselves exclusively in a very small area and a very short time interval, and it is impossible to allocate them into independent existence. The logic of our research suggests that what is perceived as three quarks, of which the baryon is composed, is nothing but the three manifestations of it divided by the relativity of the experiment along three measurements of space in its own relativity. In accordance with the basic logic of our study, the localization in each internal elementary state in each single-moment interval is reflected three independent times. Thus, in the single-moment interval, within which relative manifestations are not connected by a cause-effect sequence, it is possible to divide the measurement process into three separate stages for each of the independent spatial measurements. As a result, three separated phenomena are obtained, which are interpreted as three quarks, making up the baryon. The radial and angular properties of measurements determine two types of quarks. The change in the composition of quarks in the decay of a neutron with its transformation into a proton is determined by the turn of the proton's own measurements with respect to measurements of the local reference system. The neutron is reflected in the physical space by one radial and two angular measurements. This is determined by the addition of a projection of the angular measurement of the potential time to the two internal measurements, radial and angular. The proton is reflected in the physical space by two own angular measurements and one own radial measurement. This is determined by the fact that the projection of the radial measurement of the two-dimensional time structure have moved onto place of the projection of the angular measurement of the potential time. At the time of the neutron decay, the reorientation of its eigenvectors of space-time occurs. As a result, these vectors turn out to be shifted for elementary particles bearing a charge. The own external radial measurement of the charged particle, which has a reference point and reflects the stage of the main cycle, moves onto the main measurement of the potential time, which is an angular one. Thus, onto the angular measurement, which does not have a reference point of counting, reference point of counting and the stage of the main cycle are projected. This situation with external measurements identically affects the internal measurements. That is, the own internal radial measurement of a charged particle with a fixed position of the cycle stage is projecting on the main internal angular measurement, Fig. 21, a). However, this reflection of the stage of the main cycle cannot interfere with the free motion of a charged particle along the main measurement of the potential time. Simply as a result of this movement, the projection of the own radial measurement with its initial and final points will shift along the measurement of the potential time together with the particle itself, Fig. 21, b). This displacement will be identically reflected by the displacement of the projection of the own internal radial measurement along the main internal angular measurement. Since all charged particles are in the same stage of the cycle, they must have a completely identical projection of their own internal radial measurement onto the main internal angular measurement of the system. This identity in the identical projection to external measurements assumes the identity of the velocity of motion of charged particles according to the main measurement of the potential time. Thus, there is a force that tends to level the motion of charged particles in physical space. This force is what in physics is called a magnetic force. The magnetic force is a force caused by the difference in the velocity of motion of charged particles in physical space and tending to level this speed. In the projection on the internal measurements of space, the vector of the magnetic force is projected onto the basic angular measurement. Directions of the vector of magnetic force along the angular measurement can be two; this is the so-called right-sided twisting and left-sided twisting. However, as we have already established, the planet Earth has a chosen direction of motion around the local center of mass in the Universe. This choice is projected into internal measurements, as a fact of choosing the direction of the magnetic force. Since it is known from experience that the vector of magnetic force is right-sided twisting, we can conclude that the motion of the Earth around the center of mass of the Universe is right-sided twisting with respect to motion along the physical time vector, Fig. 22. The direction of the magnetic force relative to the direction of charge motion, the so-called "the rule of a drill" in physics or right-sided twisting, is determined by the motion of the Earth relative to the center of mass of the Universe, which is right-sided twisting with respect to motion along the physical time vector. To avoid misunderstanding, we emphasize that the so-called "center of mass of the Universe" is not a geometric or other center of the Universe. The Universe, as localization in Limitlessness with respect to itself, does not have a center. Any reference system, in this case our planet Earth, in its relativity, is always in the center of the Universe. However, the masses of matter around the Earth are uneven, which is a consequence of the fact that the Earth is part of some reference system which is global about mass and volume, but essentially a local one. Thus, the so-called "center of mass of the Universe" is essentially the center of mass of the local reference system, of which the Earth is a part.